19th century, Mongolia. 2.5″ x 2.5″. Leather and metal. Hard to fine today. This small pouch was carried by a Mongolian nomad to start a fire. It has an iron blade attached to the outside and would have a flint inside but it is now missing. It was a principal accessory worn by him. The pouch is made of leather and decorated with copper and bronze. It has a small metal plate inscribed with a signature or seal attached to the outside of the pouch. This suggests the exquisitely crafted pouch must be of significant importance to its owner who probably was a tribal leader. 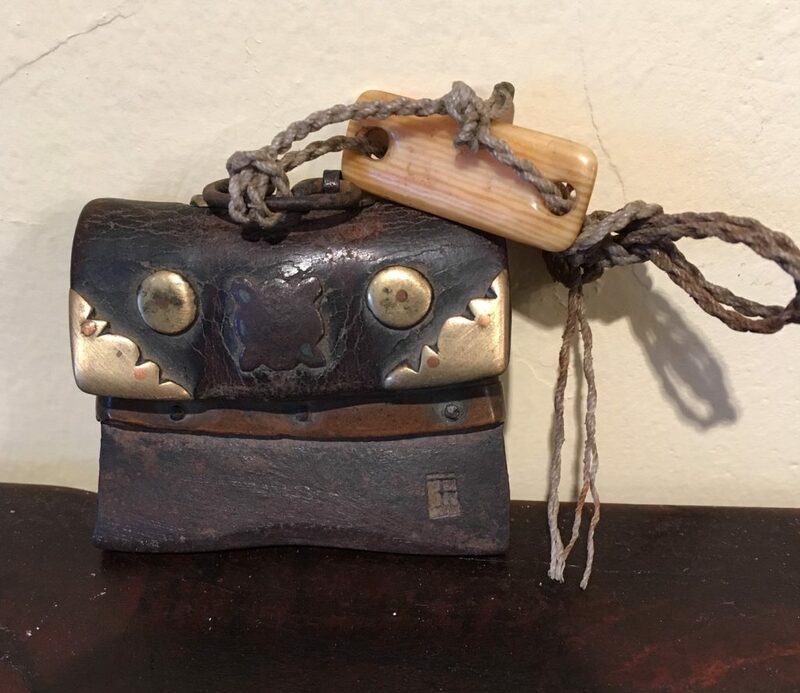 A thin braided cord threaded through a decorative piece of bone is attached to the pouch so it can dangle from a belt, much like a Japanese inro. This pouch, found in China in the 1990s, is quite rare.